This time Stefano Tesi takes the stand. At the last farm in Chersogno, the altimeter on my wrist says 1997 meters. There are another thousand to the peak. Above me are fog, rocks, and a pale trail. Below, the tattered roofs of the town of Campiglione, where a "For Sale" sign hangs over the ancient houses that look like tenements of the sort whose facades have a single open balcony per floor, though made with local materials: stone and wood. Everything crumbling or almost. And beyond, Lilliputian incredibly distant white cows working their way up the steep flank of the mountain, grazing a huge yellow meadow that opens to the sky well above the tree line. I look down with astonishment to the dirt road leading down into the valley, which becomes steadily greener at lower altitudes. This isn't just any valley. It's the Valle di San Michele, a branch of the Val Maira, in the Alpe Cozie. Occitania. No pass at the end of the climb leading to France; rather a closed gorge and a strange feeling. Lots of tiny hamlets spread about, lots of summer homes, sometimes displaying a casual use of cement. The residents who by now number dozens -- fewer than a hundred. More than money, the place seems to lack souls. In the winter, at least. In the summer the Swiss and Germans come, looking for quiet walks, and things liven up. But now it's October, and on Chersogno, in Campiglione, the Landro family is about to pack to head down to the valley for the winter. Today, they say, they're leading their animals downslope, and won't be back until spring. Sticking around is out of the question: bad weather, cold, snow, and most of all, nothing to do. In short, when the summer finishes so do the stays of the cattle and the herdspeople who stay on the slopes. Because Chersogno isn't just the name of the mountain, but also of the cheese the Landro family makes up in the meadows. People say it's like a Castelmagno, only sometimes better. They're the only ones who make it, and because of this haven't bothered to register it. In any case, when we get to their shop, following traisl closed by the forest rangers, the shop is closed too. Because they're getting the animals ready for the trop, and they've also finished all their cheese. We descend the winding trail, rocks and srubs giving way to meadows and pines, regain the paved road, and reach San Michele di Prazzo: it makes one think to discover that here, in the 18th century, there were 2,000 people. The façade of the old town hall has a solemn image of King Vittorio Emanuele II, and facing it a church whose size provides proof of the importance of the town. Two hikers with boots and packs look at us: who is the intruder? For the past ten years Enrica and Roberta Cesano have managed the Tano di Grich, an old-fashioned inn under the porticoes where people eat, sleep and buy food. And, miracle of miracles, they have a whole wheel of Chersogno. The last of the season, they say. 3 kilos (about 6 pounds), 100% cow's milk, 20 euros a kilo: It's ours! 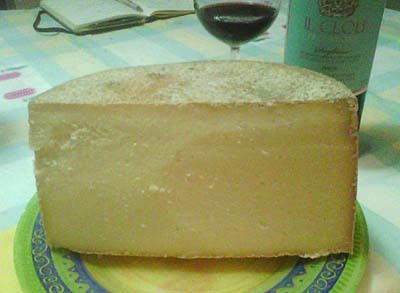 The rind is grainy, but on cutting turns out to be thin, dry, and soft. The body of the cheese is white tending towards pale yellow, and grainy, tender, holding together but not compact, rather friable. A distinctly milky aroma is barely sharpened by aging, but is still penetratingly fresh. On the palate it's deft, surprisingly soft, and soon dissolves into a delicate flavor that combines milk with more intense saltiness, and flows into bitter notes that are especially good. With chewing its initial dryness quickly gves way to a temptingly creamy, beckoning consistency. Indeed, we put a serious dent into it, washing it down with both a delightful Dolcetto di Dogliani Clavesana DOC 2011 and a more refined but just as enjoyable Barolo Cerretta 2007 from Giovanni Rosso. And the only thing that kept us from continuing was a jolt of common sense. Better make it last, because there'll be no more Chersogno until June.